There is nothing I love more as a basketball fan than relaxing at night watching a great basketball documentary. And if you’re reading this post, I bet you love them too! One of the things I highly recommend coaches do is use watching documentaries as a team bonding activity. There’s so much to learn and players always enjoy watching them. The story of Jeremy Lin’s unlikely rise to fame mid-way through the 2012 NBA season with the New York Knicks. The documentary details the adversity he had to get through in order to make it to the NBA. Documents the arrival and adaption that Yao Ming had to go through in coming to America from China, including his first season in the NBA. And how he put a country of 1.2 billion people on his back as they watched him compete with the best players in the world. A 2009 documentary exposing the truth behind the Seattle SuperSonics’ tragic exodus after 41 years in the Emerald City. They are now the Oklahoma City Thunder. A look into Jordan’s life when he decided to give up the game of basketball and pursue a career in baseball. Explore what really motivated Michael to move to baseball. Documents the life of Julius “Dr. J” Erving, the player that popularised the slam dunk. We see the effect he had on the ABA before merging with the NBA, and his life growing up on in Long Island before becoming an iconic NBA/ABA star. Take a documentary look at the career of Michael Jordan. Commonly acknowledged as the greatest basketball player who has ever lived. This film was originally created for IMAX. The story of Paul Westhead and his fast-paced offense that he implemented at Loyola Marymount with Hank Gathers and Bo Kimble. Unfortunately, Hank Gathers died on the court in 1990 and this documentary shares what happened. A documentary unlike any other. While most documentaries cover teams on a quest for a championship, this documentary covers the final week of the 2006 Caltech basketball season on their quest for a single win. This documentary follows the incredible story of the American University of Iraq women’s basketball team for a full year as we see what it’s like for them to become athletes, develop friendships, and get through adversity together. A documentary directed by Spike Lee that follows Kobe Bryant during one of the most important games of the season against the San Antonio Spurs. Get an inside view as Kobe is mic’d up and followed by 30 cameras. The story of one of the hardest times in Magic Johnson’s life, when he announced to the world that he is HIV positive. This documentary goes in-depth into Magic Johnson’s life the days leading up to the announcement, and the years after it. Narrated by Jamie Foxx and Kareem Abdul-Jabbar, they share with us the story of the greatest basketball team you’ve never heard of, The Harlem Rens, and the effect they had on basketball and society. The story of Kevin Laue and his dream to be the first one-armed basketball player ever to receive a scholarship and play on an elite NCAA Division 1 basketball team. At one point in his life, Lenny Cooke’s potential was rated among LeBron and Carmelo’s. But his NBA dream never eventuated due to lack of discipline and a few poor choices. Follows the life of American basketball player Kevin Sheppard, after he accepts a job to play basketball in the dangerous country of Iran. Apprehensive and not knowing what to expect, he is surprised to develop close friendships with three Iranian women who share similar political views. ‘Hooked’ is the story of one of the greatest players to never make the NBA, Demetrius “Hook” Mitchell. Unfortunately, he found himself in prison after a few questionable life choices (He was arrested and imprisoned for holding up a Blockbuster Video with a water gun). To show you how good this player could have been, the movie starts off with Jason Kidd and Gary Payton talking about how much better Hook Mitchell was than them at the time. Len Bias. One of the biggest ‘What if’s?’ the NBA has ever known. After being drafted 2nd overall in the 1986 NBA draft by the reigning champion Boston Celtics, Len Bias was found dead due to a cocaine overdose. At the time Bias was considered one of the best athletes in college basketball with some scouts believing he was prospect than Michael Jordan at the time. This documentary explores his rise to fame at the University of Maryland and the enormous impact that his death had on all basketball levels including interviews from all of the people close to him. The story of Jim Valvano leading the NC State Wolfpack to an NCAA championship in 1983. Their unlikely success came through a series of nine overtime and one point games. Concluding with the national championship game against Houston who featured Hakeem Olajuwon and Clyde Drexler, they became one of the biggest underdogs ever to win the title. The story of one of the countries best high school coaches, Bob Hurley Sr, and his commitment to improving the lives of the players at St Anthony’s and giving them hope for the future. The story of a troubled player with superstar potential, Chris Herren, and his battle against drugs that eventually destroyed his career. Created in 1997, ‘Soul in the Hole’ is a lesser-known film that documents a team from Brooklyn called ‘Kenny’s Kings’ as they prepare for the Soul in the Hole championship tournament. Getting their name from their coach, Kenny Jones. The film looks closely at the relationships that Coach Kenny Jones has with his players on and off the court. Particularly the 18-year-old star of the team with off-court issues, Ed ‘Booger’ Smith. A documentary on pick-up basketball. Co-directors Bobbito Garcia and Kevin Couliau visit over 180 outdoor courts in New York City. 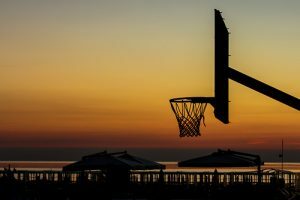 The film explores the history, culture, and social impact of New York’s summer b-ball scene, widely recognized as the worldwide “Mecca” of the sport. A documentary on the 1992 Lithuanian Basketball Team who became the symbol of Lithuania’s independence movement from the USSR. Led by their stars Sarunas Marciulionis and Arvydas Sabonis, Lithuania received a bronze medal at the Barcelona Olympics. Explores how the Big East conference of college basketball quickly rose to become the most successful basketball league in America. But eventually, the league found itself fighting for survival. A 2008 documentary that follows the lives of 8 of the best high school basketball prospects at the time leading up the 1st annual Boost Mobile Elite 24 Hoops Classic at Rucker Park. All eight players went on to play in the NBA. Documenting the relationship between Drazen Petrovic and Vlade Divac. Once teammates on the great Yugoslavian national team, their friendship was torn apart after civil war broke out and they found themselves on opposing sides. The story of a 17-year-old Chicago-born player by the name of Ben Wilson who was shockingly murdered the day before his senior year. Regarded as the best basketball prospect at the time, he was shot dead during an altercation at school. A documentary that covers the intense rivalry Reggie Miller had with the New York Knicks during the 1990’s and the feud he had with Spike Lee. There aren’t many teams that were ever feared as much as the Detroit Pistons. The Detroit Pistons of the late 1980’s – early 1990’s would do anything to win. And we do mean anything. Whether you love them or hate them, it’s a fascinating story. More than a game documents the story of LeBron James and his high school teammates (Sian Cotton, Dru Joyce III, Willie McGee, and Romeo Travis) in Akron, Ohio, and their journey to dominating high school basketball. Featuring many highlights of the young crew, we are privileged to see the beginnings of someone soon to become the greatest basketball player in the world. This is the story of the first five-man starting line up to make it to the NCAA Championship game. Those five starters were Jalen Rose, Ray Jackson, Chris Webber, Juwan Howard, and Jimmy King. With their baggy shorts and black socks, this team changed basketball in a major way. The only disappointing thing about this documentary is Chris Webber deciding not to participate in it. This documentary discusses the bowling alley brawl that Iverson was involved in as a 17-year-old that ended up with him charged and put in jail. It details the court trial he was involved him and how it became a night that would define Iverson’s young life. Follows the life of Sebastian Telfair during his senior year of high school basketball. His growing up in Coney island and attending Lincoln High school, and the struggles he went through to eventually make it to the NBA. Focuses on the big decision he had on whether to attend college or to jump immediately to the NBA in order to improve the financial situation for his family. There’s not much better than a documentary of the rivalry between two of the best basketball players that have ever lived. The HBO documentary explores how they first developed their rivalry during their NCAA years that continued on to the end of their hall of fame careers in the NBA and the influence they had on bringing increased attention to the NBA. By far the best basketball documentary ever made is Hoop Dreams. Hoop dreams shares the stories of two athletes, William Gates and Arthur Agee, from middle school to college, and the challenges and obstacles they must overcome in order to make a career out of basketball. It beautifully documents the struggle that many young players are forced to endure as they grow up in a poor neighborhood. I’ve compiled a playlist of all the listed documentaries that can be found on YouTube at the time of creating this post. I’ll do my best to keep it up-to-date and add new documentaries to the playlist when they come out. Lastly, What’s Your Favourite Basketball Documentary? I’m sure you’ve seen more than a couple of the documentaries listed above. Let us know in the comments below which one is your all-time favorite!